How rapidly can a canyon form? Mount St. Helens has provided some clues. The violent eruption of Mount St. Helens volcano in Washington State on May 18, 1980, produced a series of geologic surprises. At 8:32 a.m., an earthquake under the volcano shook the swollen and oversteepened north slope, dislodging a rockslide of more than one-half cubic mile of rock and ice. 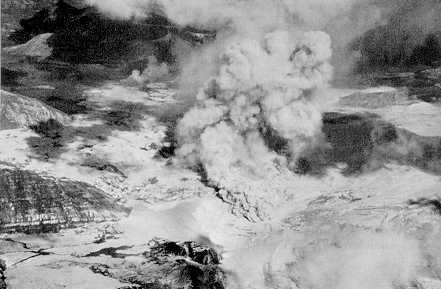 As the pressure was released by the departure of the rockslide, superheated water inside the volcano flashed to steam creating a twenty megaton, northward-directed blast of hot gas and rock fragments. In six minutes the blast leveled 3.2 billion board feet of prime forest (enough lumber to build 640,000 houses) over an area in excess of 150 square miles. The nine-hour eruption which followed was one of the most photographed and studied volcanic events in history. Not as well understood are the erosional and depositional events associated with and following the eruption of May 18. Part of the rockslide debris catastrophically displaced the water of Spirit Lake, producing waves up to 850 feet high at the north shore of the lake (Coffin 1983, Voight et al. 1981). As the water returned to its basin, it scoured slopes of trees and soil, and, together with material from the initial eruption, produced a 320-foot-thick deposit on the bottom of the lake (Meyer and Carpenter 1983). The new level of Spirit Lake has been stabilized since August 1982 by the Army Corps of Engineers at an elevation of 3460 feet, 262 feet higher than its pre-eruption level. Figure 1 shows the new shore of Spirit Lake with a cliff up to 20 feet high that was cut by erosion since the lake level was stabilized. Above this cliff is the slope scoured by the enormous early water waves. FIGURE 1. Wave-cut cliff up to 20 feet high on western shore of Spirit Lake in August 1983. The erosion of the cliff occurred during the first 12 months that the lake level was stabilized. The slope above the cliff was scoured of trees and soil by the enormous water waves generated by the May 18 rockslide. Most of the rockslide debris from the volcano's north face filled the upper 16 miles of the North Fork of Toutle River across its entire width, diverting tributary inflow to the river and blocking the outflow of Spirit Lake (Voight et al. 1981). Two-thirds of a cubic mile of rockslide and eruption debris occupies approximately 23 square miles of the valley to an average depth of 150 feet and a maximum depth of 600 feet (Voight et al. 1981). The hummocky surface of the rockslide and eruption deposits has been highly susceptible to the ravages of erosion. An enormous plain of hot pumice was deposited over the headwaters of the North Fork of the Toutle River and the south shore of Spirit Lake. The pumice was deposited on May 18 and during subsequent eruptions. Within a few days after May 18 the pumice plain was cratered with steam explosion pits which formed as a result of steam jetting from ice and water trapped in the rockslide debris buried beneath 300ºC pumice (Rowley, Kuntz and MacLeod 1981). Figure 2 shows the largest steam explosion pit on the headwaters of the North Fork of the Toutle River in the process of formation on May 23. As the jet of steam continued to ream the 125-foot-deep pit, mass wasting enlarged it to a length of 2300 feet and a width of 1000 feet. FIGURE 2. Largest steam explosion pit in the process of formation on May 23, 1980, looking east. The pit is 2300 feet long (east-west), 1000 feet wide (north-south), and extends 125 feet deep into the pumice deposit of May 18. Mount St. Helens volcano is to the right of the photograph. The southwest shore of Spirit Lake is in the upper left corner. (Photograph courtesy of the Washington State Department of Natural Resources). The pumice is composed of fine dacite ash and coarse rock fragments. Initially, it was poorly compacted, and because of its high temperature (up to 300ºC), contained no water to hold particles together by surface tension. Consequently, a variety of erosional forms developed quickly. The pumice is now cool at the surface, compacted, saturated with water, and has enough coherence to stand in near vertical cliffs. Figure 3 shows the same large explosion pit as in Figure 2, but after a flat floor had been formed by a pyroclastic flow on June 12 that deposited an additional 25 feet of pumice, reducing the depth to 100 feet. Also evident in Figure 3 is an elaborate dendritic pattern of rills and gullies on the sides of the pit that resembles badlands topography. Virtually all of these gullies and rills formed within the first five days after May 18 by the retrogressive slumping of the rim, not by water erosion. According to traditional interpretations, this topography might be assumed to require many centuries of rill and gully erosion if the rapid progress of its development had not been observed. FIGURE 3. Largest steam explosion pit viewed from the east on June 18, 1980. The pit is 2300 feet long and has a flat floor of pumice deposited by the volcano's June 12 eruption. The dendritic pattern of gullies and rills forms 100 feet of relief at the margin of the pit. 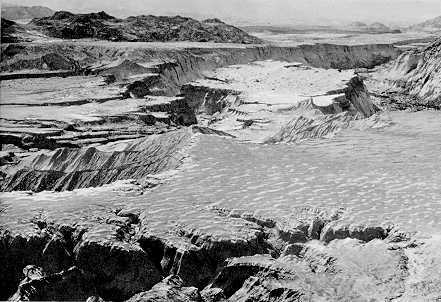 The pit was later breached by a mudflow on March 19, 1982, and forms the new canyon in the left side of Figure 5. (Photograph courtesy of the Washington State Department of Natural Resources). FIGURE 4. Gully erosion around a 500-foot-diameter steam explosion pit photographed in August 1983. Individual gullies are up to 50 feet deep. The floor of the pit contains pumice from a later eruption of Mount St. Helens. Further evidence of the rapidity of the erosion process is shown in Figure 4. Here another steam explosion pit was reamed in the May 18 pumice, with a flat floor formed by more pumice from the June 12 eruption. Again, distinct gullies eroded to 50 feet into the pumice deposit appear to have formed by mass wasting and water erosion. An explosive eruption of Mount St. Helens on March 19, 1982, melted a thick snowpack in the crater creating a destructive sheetlike flood and mudflow which downcut the rockslide and pyroclastic flow deposits north of the volcano. 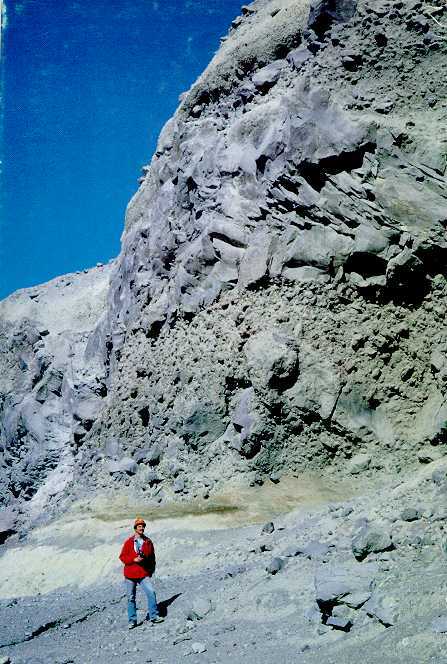 The largest steam explosion pit (shown in Figure 3 as it was previous to March 19) overflowed its west rim and cut a deep ravine into the 1980 pumice deposits to the west (Waitt et al. 1983). The flow formed anastomosing channels over much of the hummocky rockslide debris allowing cataracts to erode headward and established for the first time since 1980 a dendritic integration of the North Fork Toutle drainage. Erosion has occurred intermittently with most of the established drainage lines being formed in March 1982. The new drainage of the North Fork of the Toutle River is shown in Figure 5. A miniature "Grand Canyon" over 100 feet deep divides into several tributary drainages. The upland flat between the tributary canyons has already been severely altered by rill and gully erosion. Figure 6 shows one of these canyons in detail. Most of the major excavation of the new canyons of the North Toutle River appears to have occurred during the mudflow erosion on March 19, 1982. The new headwaters of the North Fork of the Toutle River contain other smaller drainage channels that connect steam explosion pits. One smaller channel, believed to have been breached by mudflow activity between explosion pits on March 19, 1982, is shown in Figure 7. The breaching should have occurred rapidly, and it is reasonable to suppose that this gorge formed in a single day. FIGURE 5. Westward view looking down the North Fork of the Toutle River in August 1984. The rockslide and pumice deposited in the region of the headwaters of the river have been eroded to a depth of more than 100 feet forming a new dendritic drainage pattern. The deep canyon on the left includes the breached remnant of the large steam explosion pit (Figure 3). The canyon on the right is shown in detail in Figure 6. 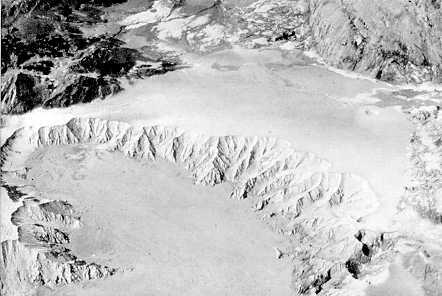 Significant canyon erosion by mudflow which established the dendritic drainage pattern occurred on March 19, 1982. FIGURE 6. Detailed view of deep canyon on the right side of Figure 5. The flat plain of pumice deposited on May 18, 1980, was eroded to a depth of more than 100 feet by August 1984. FIGURE 7. Deeply eroded gorge through May 18, 1980 pumice deposit. Photograph taken in August 1983. Man provides scale. The gorge is believed to have been breached between steam explosion pits by the mudflow of March 19, 1982. Mass wasting of the sides and water erosion of the channel have kept the gorge open, forming part of the new drainage network on the pumice plain at the headwaters of the North Fork of the Toutle River. Mount St. Helens is exceptional in the variety of erosional features formed within a limited, intensely studied area. It has allowed geologists to document local rates of erosion. An entire landscape has been subjected to various agents of sculpture including wave erosion, jetting steam, mass wasting, rill and gully erosion, sheet flooding, and mudflow erosion. The erosional features at Mount St. Helens are not unique, but are similar to those observed elsewhere. 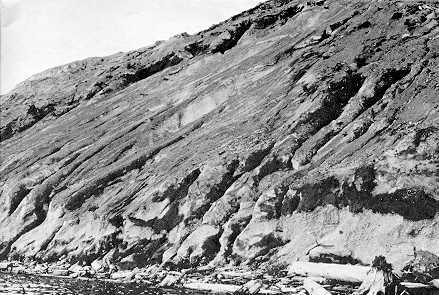 The water wave scour along the shore of Spirit Lake (Figure 1) brings to mind Lituya Bay, Alaska, the site of an enormous rockslide-generated wave in 1958 which deforested the shore up to 1720 feet above sea level (Miller 1960). The wave-cut cliff along Spirit Lake is similar to that at the volcanic island Surtsey south of Iceland where a precipitous rock cliff was eroded in 1964, just three months after a lava flow had cooled in the sea. At the base of the cliff were boulders rounded by the surf and a broad sandy beach (Thorarinsson 1964). The mass wasting which produced the dendritic rill and gully pattern at the margin of steam explosion pits (Figure 3) resembles the dendritic pattern formed on december 20, 1980, at Lake Peigneur, Louisiana. A well drilling operation in the rock beneath the lake accidentally penetrated an underground salt mine, allowing the 240 million cubic feet of lake water to empty suddenly into the mine. The drainage and associated slumping produced a pronounced dendritic pattern of channels in the lake bed within a large collapse feature for a depth of 200 to 300 feet (Martinez et al. 1981). Geologists were amazed at the rapidity with which the intricate pattern of gullies and rills was eroded in the fine-grained sediments. Water is known to rapidly erode channels of the size and scale found on Mount St. Helens. On the night of June 8, 1974, a rain storm in southern Brazil eroded a valley 16 feet deep, 50 feet wide, and 1600 feet long in a gently sloping field that before the storm was marked by only a small gully. The valley is believed to have formed in less than five minutes due to channel erosion and mass wasting during intense rainfall (Kloosterman 1976). 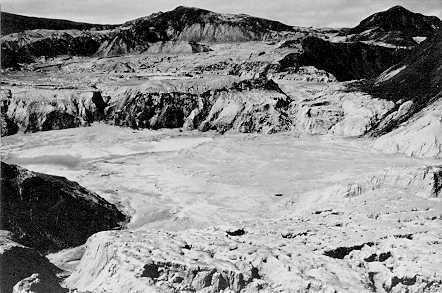 The Waiho River of New Zealand deposited 70 feet of sediment on its bed over several miles during a single, high-intensity rainstorm in 1965; then, during succeeding weeks, downcut and eroded its bank to produce a sequence of 10-foot-high terraces (Gage 1970). An extensive canyon system has formed at Providence Canyon State Park near Lumpkin, Georgia. Erosion of Providence Canyon began in the 1820s with the clearing of the land by the first white settlers. Ditches dug in the 1850s became gullies which eroded to features as wide as one quarter mile and as deep as 150 feet (Heys 1984). What may be the world's largest man-made disaster was the unrestrained flooding of the Imperial Valley of California by the Colorado River from 1905 to 1907. 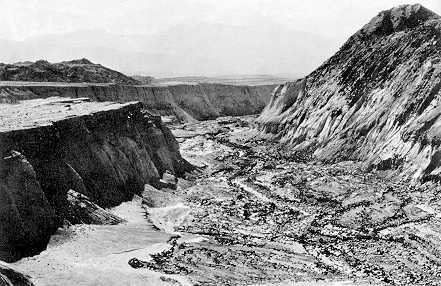 In February 1905, during a flood of the Colorado River, irrigators in Mexico were unable to control water entering a diversion canal. Soon the entire river was diverted. In nine months the runaway waters of the Colorado River had eroded the New River and Alamo River channels removing about 450 million cubic yards of recent alluvial and lacustrine sediment, almost four times the volume excavated while digging the Panama Canal (Cory 1913). Forty-three miles of channels were formed with an average width of 1000 feet and depth of 50 feet. The sediment eroded was deposited in a large delta at the south shore of a new lake called the Salton Sea. When the breached levee on the Colorado River was closed in 1907, the lake was 45 miles long, 20 miles wide, and covered an area of about 520 square miles. The analysis of the erosion features at Mount St. Helens and elsewhere causes one to ask how erosion progresses on a newly formed landscape. Is erosion accomplished primarily by the cumulative effects of slowly operating agents acting more or less continuously? Or, is erosion accomplished primarily by the singular effects of catastrophic agents acting intermittently? Stated simply, is erosion chiefly a uniformitarian or catastrophic process? According to popular geomorphic theory, landforms have evolved by the relentless operation of slow erosion processes. Canyons are believed to have deepened slowly and extended headward imperceptibly becoming the end product of minute changes accumulated over millions of years. William Morris Davis, whose theories have dominated geomorphology, sketched the theory that landscapes evolved slowly through the "cycle of erosion" in stages from "youthful" to "mature" to "old age." 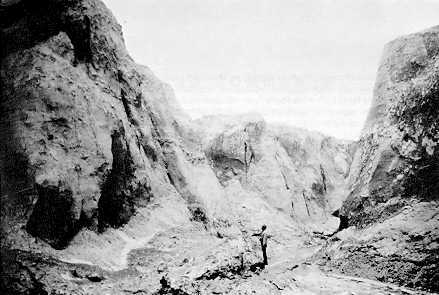 According to Davis (1902), the equilibrium profile of a slope became precisely graded to slow erosive agents more than one million years after the completion of the "youthful" stage. The observations at Mount St. Helens and elsewhere, however, show in miniature that adjustments toward the graded equilibrium condition can occur rapidly, especially when a critical energy threshold is exceeded by erosion processes. Even the first four years of erosion at Mount St. Helens was noticeably discontinuous. Mudflow erosion on March 18, 1982, established the dendritic drainage which could be regarded as approaching a "mature" landscape on the North Fork of the Toutle River with canyons over 100 feet deep. Mass wasting has been most significant in headward erosion forming rills and gullies within a period of a few days. What conventional geomorphic theory says takes thousands of years may, instead, be accomplished within a few years. Geomorphologists have learned that the time scale they have been trained to attach to landform development may be misleading. Field research for this paper was supported in part by the Institute for Creation Research. Harold G. Coffin of the Geoscience Research Institute provided assistance at Mount St. Helens, Washington. Photography by the Washington State Department of Natural Resources was provided by the National Geophysical Data Center of the National Oceanic and Atmospheric Administration. Coffin, H. G. 1983. Mount St. Helens and Spirit Lake. Origins 10(1):9-17. Cory, H. T. 1913. Irrigation and river control in the Colorado River delta. Transactions of the American Society of Civil Engineers 76:1204-1453. Davis, W. M. 1902. Base-level, grade, and peneplain. Journal of Geology 10:77-111. Gage, M. 1970. The tempo of geomorphic change. Journal of Geology 78:619-625. Heys, S. 1984. Our little Grand Canyon. The Atlanta Journal, Weekend Supplement, September 1, p. 4. Kloosterman, J. B. 1976. Overnight valley formation in Sao Nicoulau. Catastrophist Geology 1(2):44, 45. Martinez, J. D., M. B. Kumar, C. R. Kolb, and J. M. Coleman. 1981. Catastrophic drawdown shapes floor. Geotimes 26(3):14-16. Meyer, W. and P. J. Carpenter. 1983. Filling of Spirit Lake, Washington. U.S. Geological Survey Open File Report 82-771. Miller, D. J. 1960. Giant waves in Lituya Bay Alaska. U.S. Geological Survey Professional Paper 354-C, pp. 51-83. Rowley, P. D., M. A. Kuntz, and N. S. MacLeod. 1981. Pyroclastic-flow deposits. In P. W. Lipman and D. R. Mullineaux, eds. The 1980 Eruptions of Mount St. Helens, Washington. 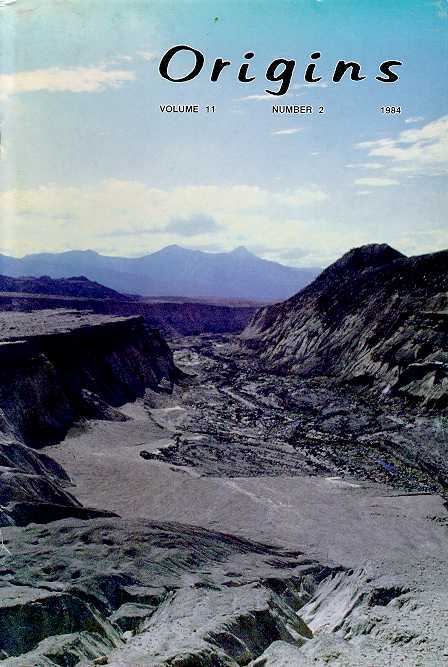 U.S. Geological Survey Professional Paper 1250, pp. 489-512. Thorarinsson, S. 1964. Surtsey: the new island in the North Atlantic. Viking Press, New York. Voight, B., H. Glicken, R. J. Janda, and P. M. Douglas. 1981. Catastrophic rockslide avalanche of May 18. In P. W. Lipman and D. R. Mullineaux, eds. The 1980 Eruptions of Mount St. Helens, Washington. U.S. Geological Survey Professional Paper 1250, pp. 347-377. Waitt, R. B., Jr., T. C. Pierson, N. S. MacLeod, R. J. Janda, B. Voight, and R. T. Holcomb. 1983. Eruption-triggered avalanche, flood, and lahar at Mount St. Helens  effects of winter snowpack. Science 221:1394-1397. FRONT COVER. Westward view of a new canyon on the North Fork of the Toutle River formed rapidly after the 1980 eruption of Mount St. Helens. Photograph taken in August 1984 by Steven A. Austin. BACK COVER. Cliff at base of north slope of Mount St. Helens. The cliff was eroded by water, mudflows and pyroclastic flows since the May 18, 1980 eruption of the volcano. The cliff is composed of pre-1980 volcanic deposits: tuff bed (at the level of the man), mudflow breccia, and a prehistoric dacite lave flow (near the top of the cliff). Photograph by Scott Rugg.